The availability of the CQ WW public logs covering the period 2005 to 2015 allows us to look at various trends over that period. The number of assisted entrants shows a remarkably constant increase from year to year, whereas the unassisted numbers are close to constant. It will be interesting to see whether the assisted lines cross the unassisted lines next year. As I have noted before, on SSB the percentage of logs from western EU has decreased somewhat, and the percentage from JA/HL and zone 28 has slightly increased. 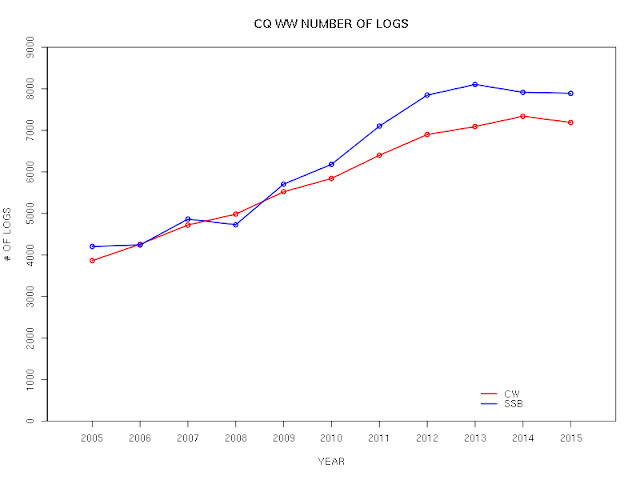 This shows the perhaps not-unexpected reality that as the number of assisted logs has increased, the number of QSOs in the top 10 percent of logs (as determined by number of QSOs in the log) has steadily declined. The median number of QSOs (represented by the coloured near-horizontal lines) has varied little, with only SSB Assisted showing a clear change in recent years, although both CW and SSB Assisted show a more or less gentle trend downwards in the median number of QSOs in the logs. 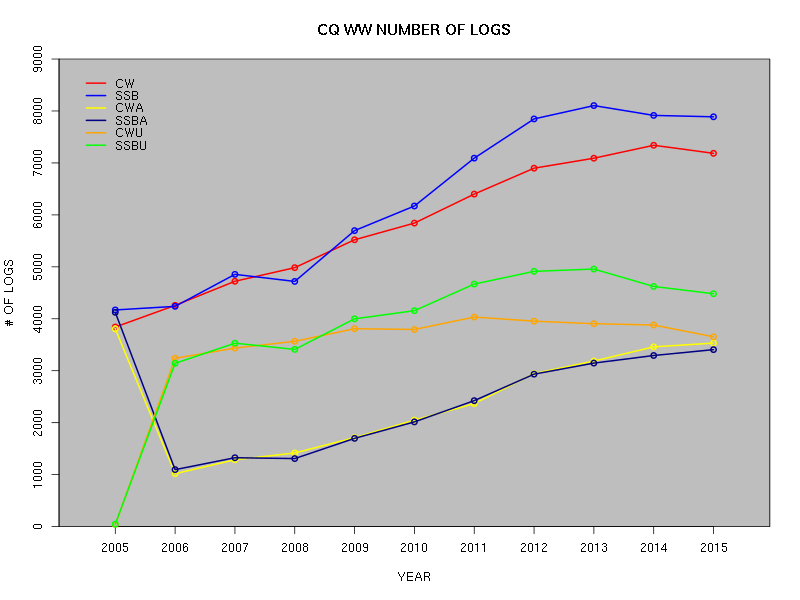 One unexpected fact emerges: the median log in CQ WW CW has consistently contained about a hundred more QSOs than has the median CQ WW SSB log. I'm not sure why this should be, but it is a robust result. Now, how about whether the CQ WW contest is actually gaining in popularity, as is often claimed (without any supporting evidence for the declaration, as far as I know). How many people are actually getting on the air and making QSOs in the contest? 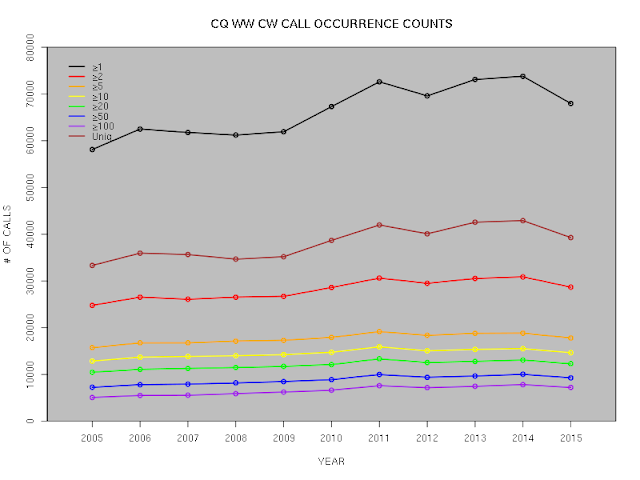 Different people may set the bar as to how many times a call has to appear in the logs of other stations at different values. For example, if a call appears only once, it might well be a bust rather than a real participant. 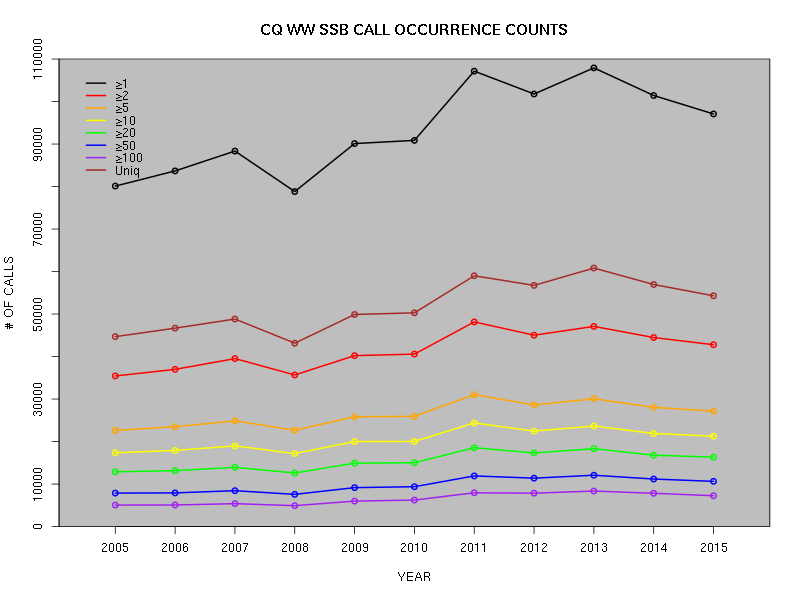 Even if a call appears, say, twenty times, that might merely reflect a busted spot that was logged by twenty people who did not check the call. So we can produce a series of nearly-parallel lines, setting the required number of appearances at different values. 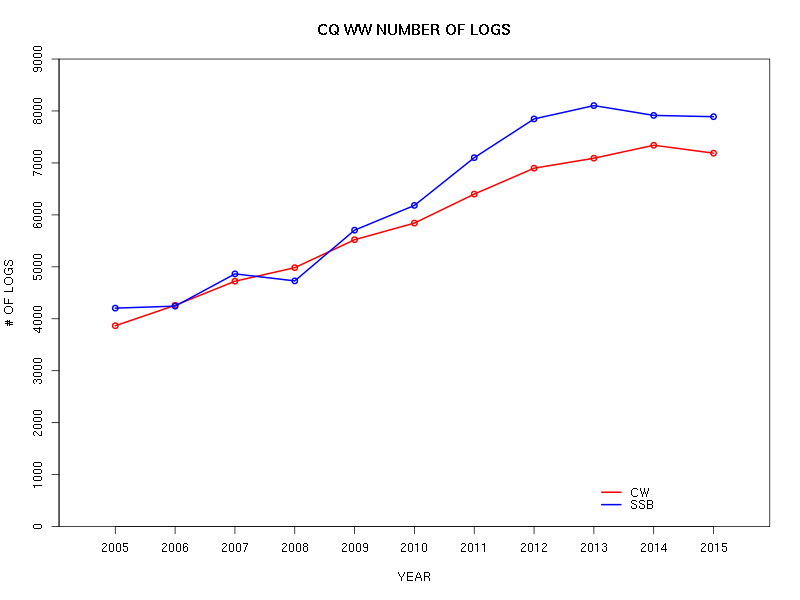 On CW, it makes no substantive difference which definition of participation one chooses: the number of participants is essentially unchanged from year to year. Any increase in recent years is marginal at best. On SSB, there is indication of a slight decline in recent years. 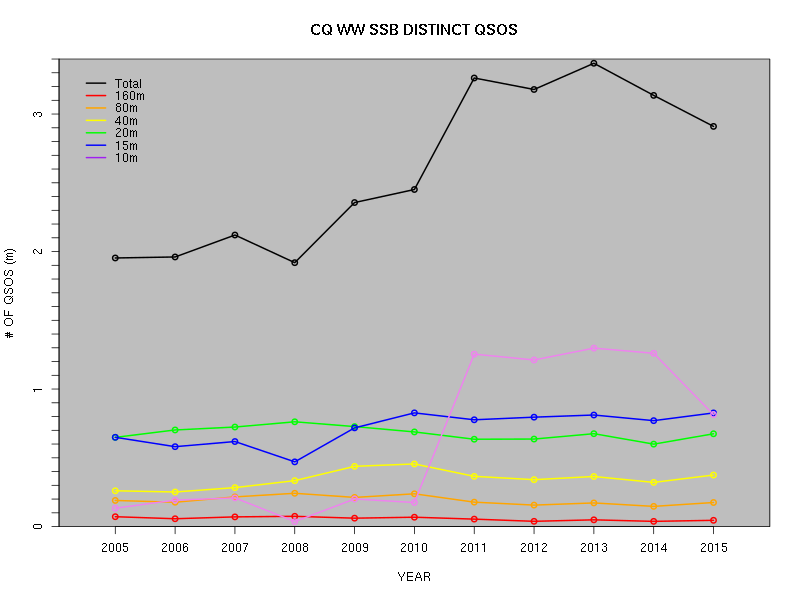 Finally, it's of some interest to plot the year-by-year number of distinct QSOs made on each band. 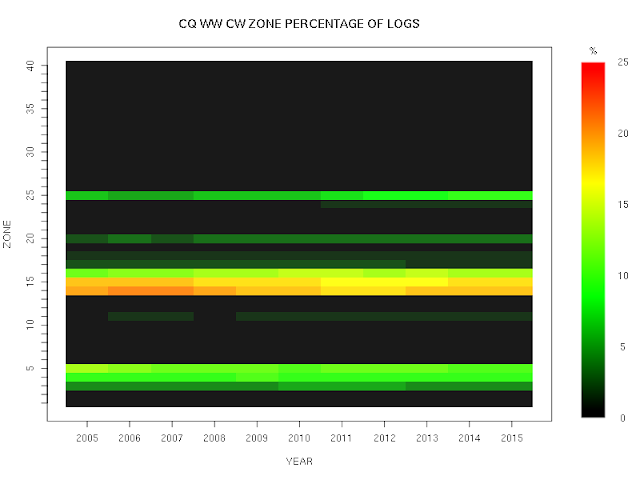 By "distinct" I mean that a QSO both sides of which are logged by entrants counts just once. In both cases, one can see the importance of 10m in determining the total number of distinct QSOs. 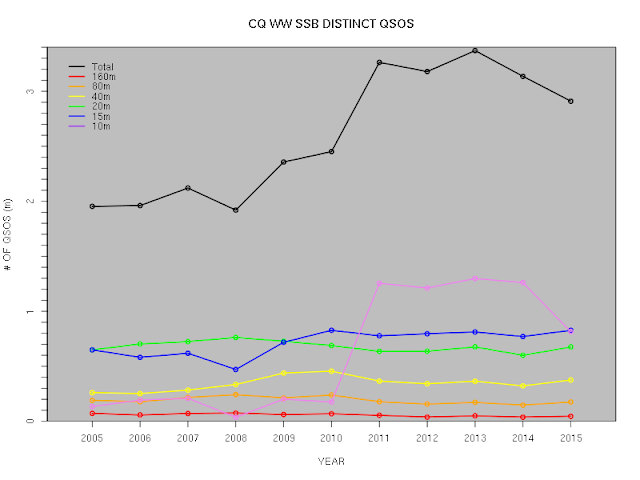 However, while 10m is the most dominant band on SSB in years of good propagation, that is not true on CW: on CW, in years of good propagation, 10m, 15m, 20m and 40m provide essentially identical contributions to the total. 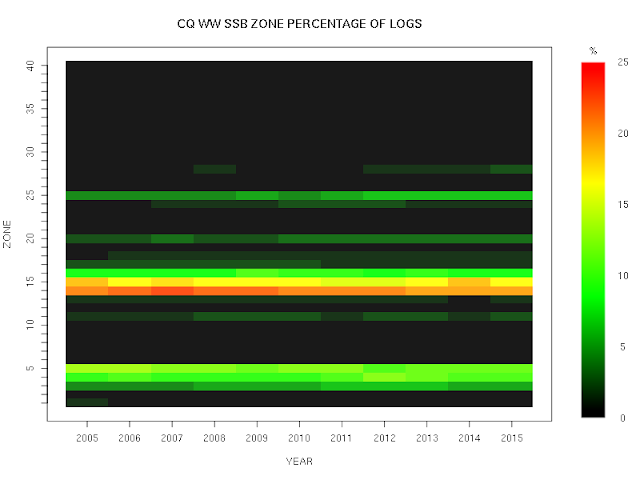 We also see that on CW, 20m and 40m provide nearly identical numbers throughout the cycle; on SSB, 20m and 15m have this characteristic. 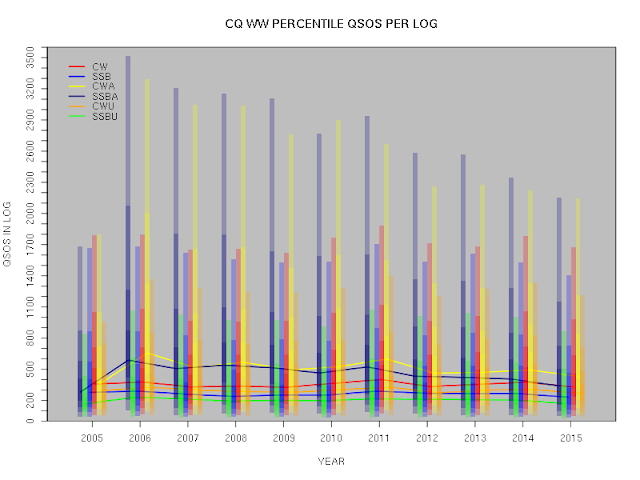 The relative lack of dominance of 10m on CW is likely due to the timing of the two contests (indeed, I wish that both CQ WPX and CQ WW would swap the SSB and CW events each year; with the current calendar, CW suffers in both types of contest). By the end of November, the number of hours of common daylight between EU and NA are simply too few for 10m to be dominant.